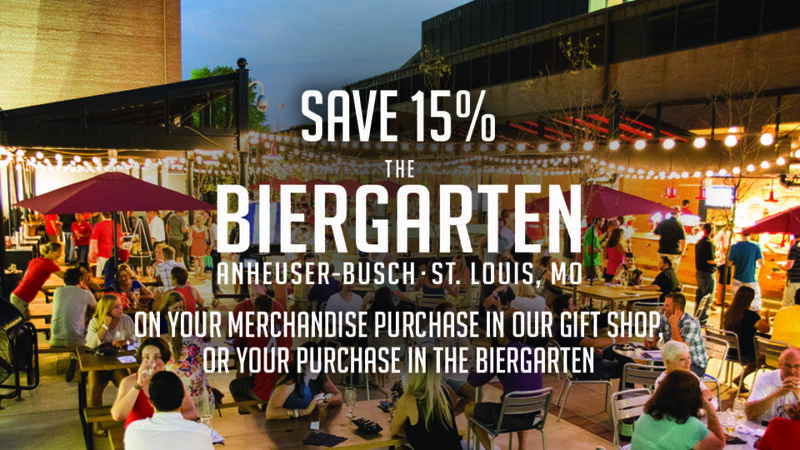 Save 15% on your food purchase at The Biergarten or your merchandise purchase in the Gift Shop. Not valid with any other offers. Some exclusions apply. Expires 12/30/19. The Biergarten is a truly unique space that offers a charming view of an urban landscape as you kick back and enjoy the premium beers and fare from our full menu. The Biergarten is an unforgettable venue for special occasions and private events. And be sure to check out our gift shop for the latest Budweiser, Bud Light, Michelob Ultra and many more brands for merchandise, including apparel, hats, glassware, culinary items, novelty items and much more. Each gift shop has a variety of Anheuser-Busch beers, including a display that allows you to create your own six-pack.